Well, it never rains, it pours. This season has brought us many good things, along with our new house. I am pleased to announce that I've landed myself a spiffy little writing gig. So far, I've written articles on things like growing sprouts, making aprons, and shopping at the farmer's market, for an excellent little sustainability-minded site called Grow and Make. If this sounds like it's right up my alley, well, that would be the understatement of the century. This means several things. One, in addition to wife, daughter, caretaker, barista, gardener, seamstress, and chef, I am also contributing editor. I quite like the sound of that one. Three jobs, though, goodness. How did that happen? Thirdly, we are looking for contributors. Next week we're going to launch a sort of Sustainability Show and Tell series-- like the Design*Sponge before + after posts, only green. Anything from refashioning clothing to making stock to reupholstering a couch-- it's all fair game, as long as you've got pictures. If you'd like to be featured on Grow and Make, and get a cute little button for your blog, let me know at adiantumpedatum (at) yahoo (dot) com. The real point of this post (now that I'm finally getting to it...) is a giveaway. It seems only right to host one in celebration of things--houses and dreams and new directions--and for you all. You've been out there-- some since the very beginning--commenting and cheering me on even in those days of single-digit hit counts and three followers. Your comments make my day like nothing else. You rock my socks! And so, this is for you. 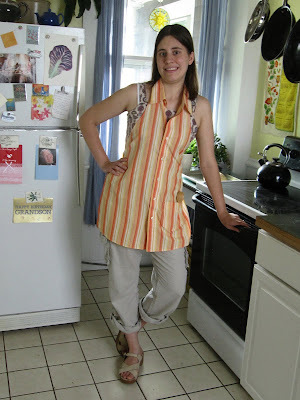 The apron I am wearing in the picture is one I made for a Grow and Make article last week. It's refashioned from a button-down shirt. If you'd like to win it, leave a comment on this post before midnight, Monday, June 28th. You are amazing. I know I've said it before, but gosh! You just keep on rockin' there, woman! Enjoy your life! P.S. Please remove my name from the giveaway. I just had to tell you how much you rock. Dear One - You do rock!! You make a Mom proud and I didn't even birth you! Congratulations on all you have accomplished. i may not always leave a comment, but i read all of your posts! congratulations on dreams-coming-true! how very exciting for you, and much-deserved, i'd say! Congratulations on the new house & job!